Legend has it that the Zamboni device on display at SPARK Museum of Electrical Invention worked perpetually for more up to century. Only a few examples — including the one in the Museum’s collection — survive of these extremely rare pieces, which formed the earliest research on very high voltage batteries. In a hallway outside the Clarendon Library at the University of Oxford in England, a little electric bell has been ringing almost non-stop since 1840. It certainly hasn’t been plugged in to the wall, so what’s the explanation for this long-running electrical marvel? The device hasn’t been taken apart to be examined, but experts’ best guesses are that it is based on the work of Italian physicist and abbot Giuseppe Zamboni, who in the early 19th century developed a method of making high-voltage Volta piles, which functioned as early batteries. A gorgeous example of one of Zamboni’s early devices is in the collection at SPARK Museum of Electrical Invention in Bellingham. It’s an extremely rare piece; there aren’t many like it anywhere in the world. Zamboni’s method was to create stacks of very thin metal foil and paper, one alternating with the other. Using this method, he created piles of more than 2,000 layers that stood less than a foot tall. These early batteries were about the size and shape of a candlestick. With their high voltage, these batteries created an electrostatic charge on their terminals, and Zamboni set out finding ways to use that charge in practical applications. In one of his inventions — the one on display at SPARK Museum — Zamboni placed a pendulum between two of his Volta piles. Each pile alternately attracted the pendulum, creating a regular back-and-forth motion. 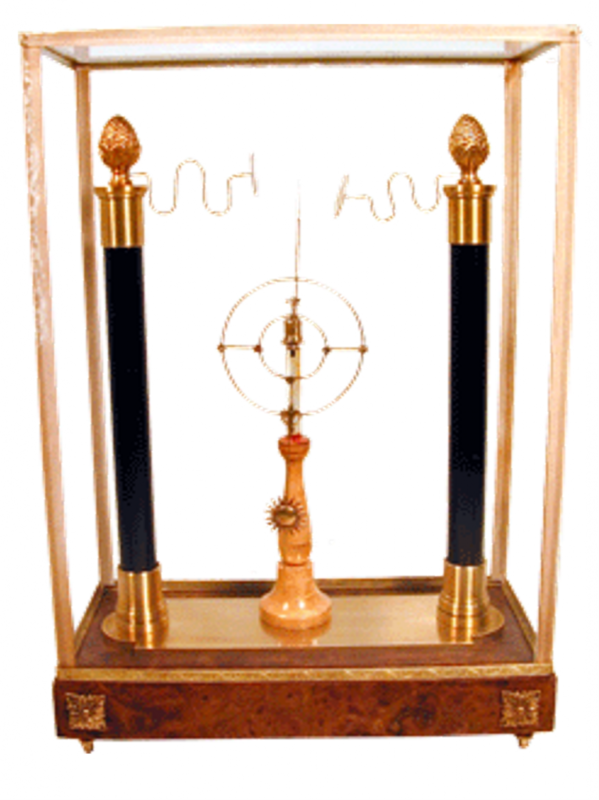 This mechanism formed the basis for the first electrostatic clocks. Legend has it that the Zamboni device on display at SPARK Museum of Electrical Invention worked perpetually for up to a century. Only a few examples — including the one in the Museum’s collection — survive of these extremely rare pieces, which formed the earliest research on very high voltage batteries. Despite their long-running ability, Zamboni’s devices technically weren’t perpetual-motion machines. But they were marvels that evince the ingenuity, wonder and experimentation that are the basis of so many STEM discoveries — whether back in the early 1800s or in the minds of the many kids who wander SPARK’s halls today. Stop in with your family — or your class — and get a dose of your own inspiration! 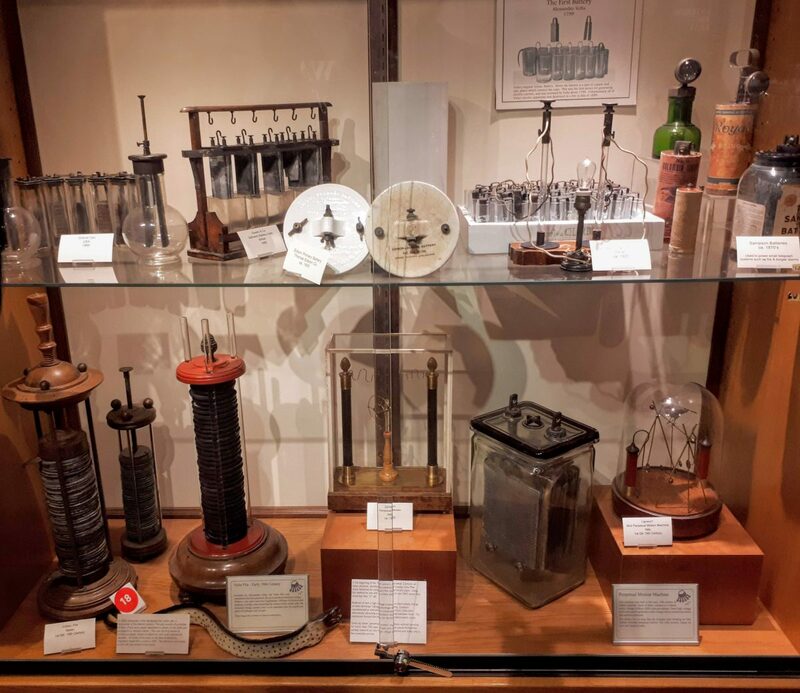 Our docent-led tours are wonderful for helping inquisitive minds discover and understand the myriad electrical inventions SPARK has on display. MORE: Interested in delightful electrical inventions? Read about the undertaker who revolutionized telephone technology by inventing the rotary dial.